Thanks to Jim Mitchell who sent me a scan of R. G. Mitchell’s typewritten letter with his signature. Below is my transcription. Dr. J. T. Mitchell, Kansas City, Mo. You will find enclosed a card and a letter which I have just received from mother. You will notice she suggests that I send the same to you and that you, after you have read them, send them to William. I have just written her and also Callie. Callie wants Mother to spend the winter with her. I have not talked with Mother about it, but I want her to have her own wish about the matter. She is welcome at my house and I am arranging to have it more comfortable for her than it was last winter. The floods that you are having must be very distressing from the paper reports. We are all well. 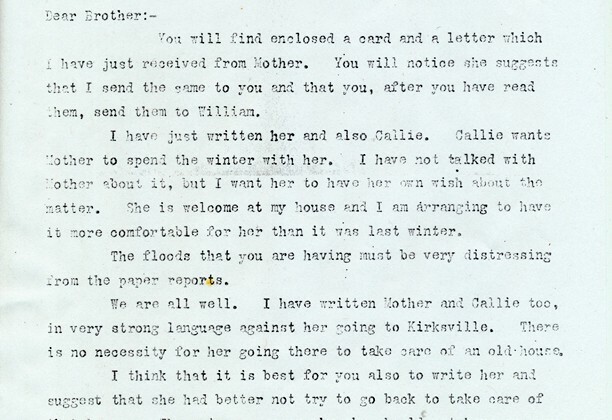 I have written Mother and Callie too, in very strong language against her going to Kirksville. There is no necessity for her going there to take care of an old house. I think that it is best for you also to write her and suggest that she had better not try to go back to take care of that house. There is no reason why she should not have an easy time living around among the children just as she would desire, for any of them would be glad to have her at any time or all the time. Love to you from all of us and to Orlando’s family. 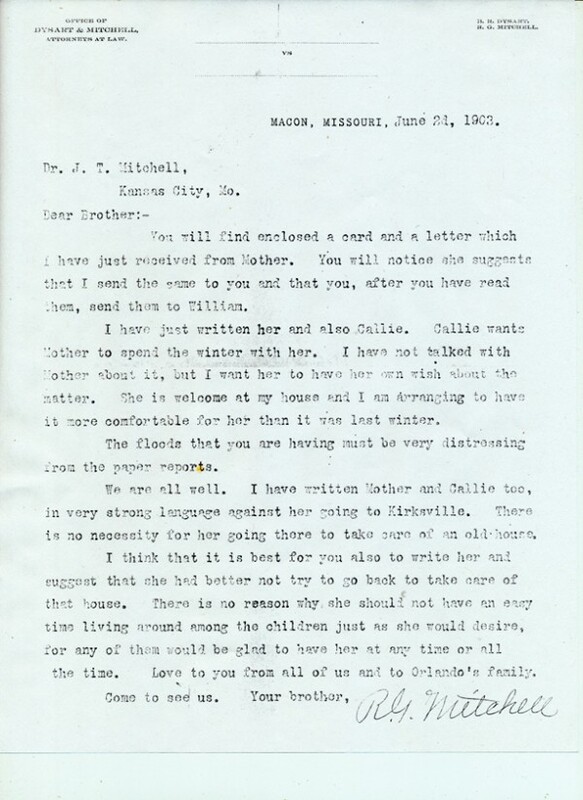 Robert Gwyn, the third son of Martha Cowden Dysart Mitchell, is writing his eldest brother concerning their mother, Martha Cowden Dysart Mitchell, who was about 78 at the time. William would have been the Revd. James William Mitchell, the second eldest brother. Callie would be Louisiana Caroline Mitchell Fullerton, the second eldest daughter. She was in St. Louis, Missouri. Robert Gwyn Mitchell was then living in Macon, Missouri with wife Lena Bell Carhart and children Margaret and Robert.